If you want to choose a set of makeup brushes you will have a much easier time if you understand the best characteristics of different makeup brushes that a professional makeup artist would tell you to look for. The purpose of doing this is to achieve the best look possible. Makeup brushes come in a variety of handle lengths, weights, colors and styles. We looked at the 15 most popular makeup brush sets on the market and considered their variety of brushes included, carrying case, design of the brushes, reputation of the manufacturer, Length of handles, strength of the bristles and other considerations. The three makeup brush sets that we have reviewed below are all excellent choices for applying your makeup. There are some considerations you want to look at when you are perusing different make up brushes. By thinking about these things before you purchase any brushes you will be able to choose the set that will fit your needs the best. Makeup brushes are available individually and in sets as well. With all of the choices you will have to sort through, you will need to do some research and make sure that you are purchasing a set of makeup brushes that will have the different brushes you need, that won’t fall apart or gum up and that will last a long time. SHANY is a well known and loved brand in the cosmetic industry. This 32 piece natural makeup brush kit is made from badger, sable and goat bristles that are ultra soft. These luxury makeup brushes have everything you need to create beautiful looks whether it is for casual, business or evenings out. These brushes have been designed in the United States by artists. SHANY is a member of PETA and are against animal cruelty or testing of any kind. You’ll get all the above brushes plus a few other shaders. This set has everything you need to create any look you want. The white carrying case is sleek and stylish and makes traveling with your makeup brushes super easy and convenient. It looks great sitting on the counter too. 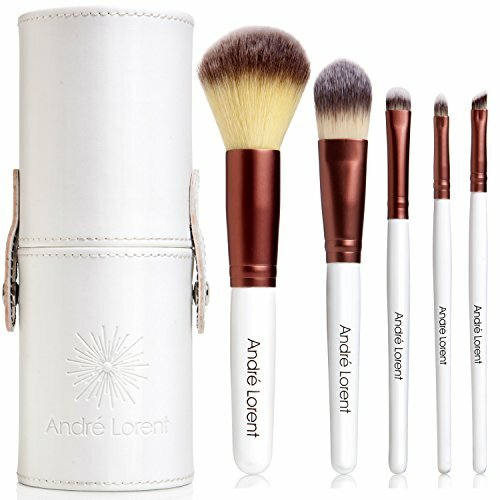 The brushes in the #1 PRO makeup brush set from Andre Lorent use LuxeFiberTM, which is a superior quality synthetic bristle that reduces bristles falling out and allows them to last much longer than traditional brushes. You will also get a much smoother application of all your favorite makeup as well. LuxeFiberTM are vegan certified, and are very hygienic and animal cruelty free. The brushes have a lifetime guarantee. 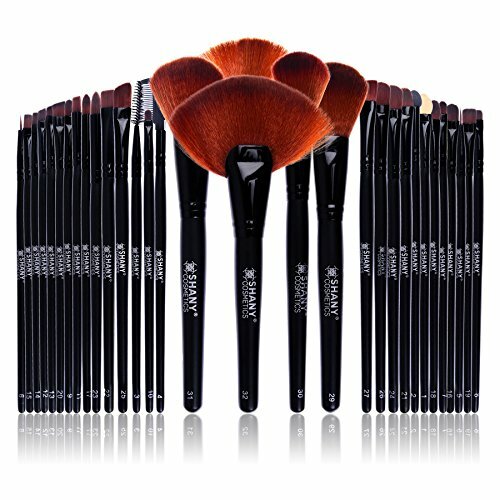 This fantastic 32 pc makeup brush set has all the brushes you need for everyday use and professional use as well. The thick, soft fiber bristles are synthetic and very gentle; perfect for smooth makeup application that is flawless. The long handles on these brushes make them easy to handle and use, especially if you have long fingernails. The bristles are easy to clean which helps them last longer and prevents skin irritation from using unclean brushes. You’ll have everything you need for every type of makeup and any type of look. These brushes come with a 12 month warranty. Make up brushes are something that many casual makeup wearers don’t think about, but once you’ve used makeup brushes instead of Qtips or your fingers, you won’t ever want to be without them again. The three makeup brush sets we have featured above are all high quality, excellent sets that will help you apply your makeup in a smooth and professional-like way. If you are a makeup professional, you will love these top rated makeup brush sets as well. All three choices are cruelty free, vegan certified and made with high quality synthetic and natural fibers. You will not be disappointed with any one of these sets. Continue reading out buyer’s guide that will give you more information on makeup brush sets and how to choose the right set for your needs. This information will make it much easier for you to sort through all your choices and make the right decision for you that you will feel great about. The different facets of the makeup brush that are important to its overall quality include the material the bristles are made of, which can be animal hair such as squirrel, sable, pony, goat, badger, etc) or it will be synthetic bristles such as acrylic, plastic or nylon. Each type of bristle has different benefits. Natural animal bristles contain cuticles just like human hair has and absorbs the pigment of the makeup. Due to the soft feel of the bristles, they are the perfect choice for applying blushes, eyeshadows, bronzers and other powder based makeup. Synthetic bristles are better when you don’t want to have as much of the makeup absorbed by the brush. This is better for applying creams and liquids and allows for better precision. Makeup brushes can have many different head shapes. They come in short, square, domed, angled, loose bristles like a paintbrush and rounded. Each shape has a specific purpose when it comes to how the makeup is applied. We have listed the different types of brush shapes below and provided information about each so you can decide which ones are important to have in the makeup brush set you choose. Chisel – The bristles of the chisel shaped brush have a very narrow profile with the tips shaped into different round shapes. This type of brush is good for blending and contouring. Pointed – In a pointed brush the bristles will be barrel-shaped or in a full round design. The tips of the bristles will be taped so you can do line work and detailed applications with no problem. Square/Angled – The bristles in a square brush have a sharp angle or are flat across the top. Kabuki – This type is similar to the round bristled brush but they are more tightly packed and more luxurious. Kabuki brushes are available in flat top, domed and angled. Round – The bristles of a round brush are usually in a barrel shaped layout. The bristles will be angled, domed or flat across the top. There are many different types of makeup brushes on the market. Makeup brush sets usually have a wide range of brush types to cover all aspects of applying makeup. You can use each type of brush for what it is designed for or for any other type of makeup application you choose. The important thing is to like using the makeup brushes you purchase. Blush/Contour Brush< – Natural bristles from animal hair work really well for a blush or contouring brush. The natural bristles pick up the pigment of the blush and help it blend beautifully on your skin. Blush or contour brushes usually have dome or angled heads which make them ideal for thoroughly blending the blush. Powder Brush – The bristles of a powder brush are made from two different kinds of hair; either synthetic or natural. Either one works well for a powder brush. It is recommended to look for a powder brush that has a rounded shape. Most powder brushes are medium size. Foundation Brush – Both synthetic and natural hair bristles are good for foundation brushes. They are used to blend foundation evenly. The head of a foundation brush is best when it is small to medium sized and flat with contoured bristles. Highlighter Brush – Natural or synthetic bristles are just fine for a highlighter brush. These brushes are often used to apply shimmer, color or glitter to the brow bone area and the cheekbones. It will be easiest to apply using highlighter brushes. The head of a highlighter brush is usually flat across and has a circular brush that works for all kinds of highlighting and general makeup work. Concealer Brush – Synthetic bristles are good for a concealer brush. This is because the synthetic bristles will avoid picking up excess concealer. They typically have a small. Stiff feel and will have plenty of precision when concealing small areas like blemishes, etc. Eyeshadow Brush – Natural or synthetic bristles, with a small, flat, half moon head shape that has soft bristles. This allows the brush to apply shadow in an even manner. Lid brushes will usually be square and more stiff and the eye crease brush will be tapered and have an angle or have a dome shape. Eyeliner/Eye Pencil Brush – An eyeliner brush does very well with synthetic bristles since they won’t pick up as much of the liner and will increase the precision when blending. Eyeliner brushes will have either a small head with square bristles or a pointed head with stiffer bristles. Brow Brush – Brow brushes have a mascara like head. They work well for combing the brows and keeping them in order. If you brush the brow area after applying brow pencil it will have a more natural appearance. Lash Comb – The lash combs are usually metal and work very well to remove any clumps that are on the lashes after applying mascara. You will find that lash comb teeth vary in width to provide the effect you are looking for. Kabuki Brush – Kabuki brushes have natural or synthetic bristles. They are similar to powder brushes in that they typically have soft bristles along with a round head. The bristles are usually short and dense to provide more coverage. They are often used to create a soft, airbrush-like look and to create shimmer along the cheekbones. Lip Brush – Lip brushes are usually made from synthetic bristles. They won’t pick up too much of the lipstick which allows the wearer to apply thinner layers of lipstick rather than a thick, heavy layer. The heads of lip brushes are short with firm bristles. When washing your makeup brushes, use dish soap, makeup brush cleaner or baby shampoo. Once they have been washed and rinsed, place them on a towel with the bristles pointing down. This allows the water to drain from the head of the brush. This will also reduce the chances of the glue loosening up that is holding the bristles in place. There is a staggering amount of makeup brush sets on the market. If you place quality at the head of the list, you will be able to sort through the endless sea of choices that are available. Don’t purchase a set of makeup brushes based on brand name alone. Look at customer comments, the variety of brushes offered in the set, the cost, the construction (read the descriptions) and other factors before making a decision. Go through the list of makeup brushes that we have listed above and see which ones are important to you. You might want all of them, or just a few select types. This buyer’s guide is designed to help guide you to the makeup brush set that you will love using every time you apply makeup and that will last a long time as well.